When I got home from work yesterday, there was a package on my front steps. I assumed this was my recent order at Knit Pixiekpixie (I ordered this Karabella pattern– apparently I’m the first to order that pattern, so you can see what else I bought at the bottom of that page). I carried my groceries to the front door and peered at the package. Whoa. 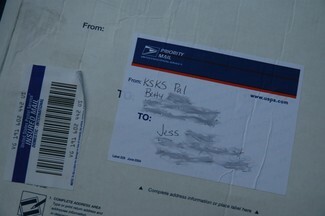 It’s not my package from kpixie — it’s my KSKS package from my no-longer-secret-pal, Betty of Knitting Betty! Although I was tempted to tear into the package on the front steps, I took it inside, took the dogs out, and put the groceries away first. Then, I finally let myself open the package. The first thing I pulled out of the box was a huge ziploc bag of yarn! a whole lot of sock yarn! Whoa! That’s a lot of yarn! We have two hanks of a gorgeous red Koigu (yum!! 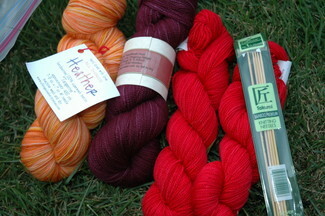 ), variegated orangey/yellow yarn from All Things Heather (yum yum! ), and an almost solid aubergine shade dyed by Dave over Cabin Cove (yet more yum!). Whoa! Wonderful yarn, and all yarn I would have picked out myself left to my own devices. Also included is a set of US1 clover bamboos. I am in awe! Obviously, Betty already went above and beyond. 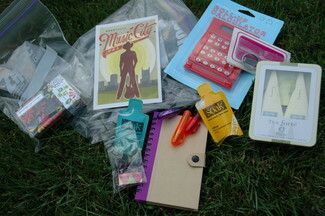 However there was more stuff in the box! A little notepad, the perfect size for carrying around with my socks-in-progress. Little pens, also the perfect size! A rolling calculator, which I think is so cool. After taking four years of insane calculus, I have trouble with basic math. It’s like when you start working integrals in 20 dimensions, you forget how to divide! Folding scissors, perfect for me since I keep losing all of my scissors. Two different types of a brand of wool wash I’ve never seen. A bar of delicious smelling soap — DH and I are soap fiends! Some jasmine tea in silk tea bags — yum! Lastly, a beaded row counter from Mama Llama that I couldn’t get a good picture of, but it is so cool, with dark purple and clear beads, and a sheepie bead. Thanks, Betty! I hope you and your family have a great trip and I look forward to chatting with you when you get back. I love the package you sent! wow, look at all the goodies you got in the mail! what a lucky girl! What a great package! Love the yarns, they’ll make wonderful socks. I totally know what you mean about forgetting how to do basic math…after taking a bajillion hours of math courses needed for an engineering degree, you become somewhat reliant on your calculator ( TI-89 is my choice :) ). Long Division is a skill that has completely escaped me, I don’t think I could do a division that wasn’t very simple, and especially not if decimals are involved.